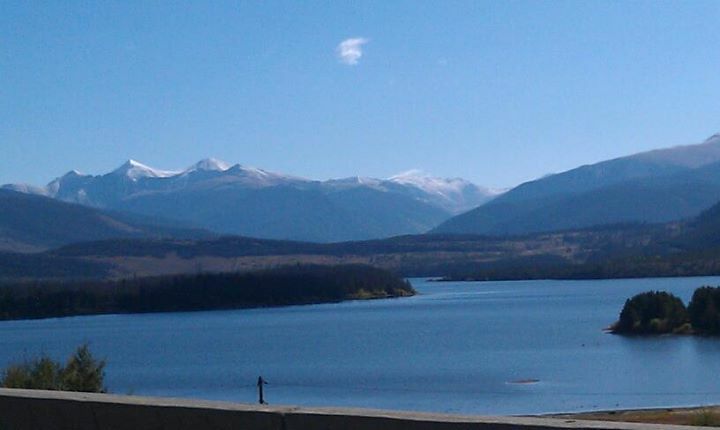 Last weekend the Smart Man and I had a weekend getaway to Breckenridge, Colorado for the Breckenridge Oktoberfest. We were really looking forward to it, as this was the first of our Colorado Adventures. We stayed at the Abbett Placer Inn, a lovely bed and breakfast two blocks from Main Street. 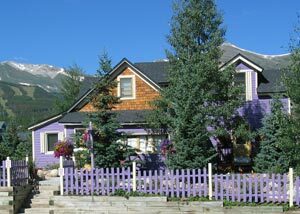 It was a lovely home, a refurbished Victorian whose only negative attribute was the fact that the outside was painted a really odd shade of purple, including the picket fence. Our room was the "Miners Shaft Suite," and was decorated with historic photos and implements from Breckenridge's mining history. The Innkeepers were both gracious, the breakfasts were delicious, and the entire operation was extremely well organized and easy. Score on the B&B! The first night we were there, we wandered around looking for a place to eat and ended up at a place called The Hearthstone, a fine restaurant a block from the Inn. Housed in another renovated Victorian home, it was charming, the service was exemplary, and the food was amazing. The Smart Man had the Blackberry Elk (one of their specialties), and I had the Striped Bass. For dessert we enjoyed their version of a banana split, which should probably be illegal. The following day we went down to the Oktoberfest, and wouldn't you know it - the weather WOULD NOT COOPERATE. It rained on and off (mostly on) for the entire day, and was chilly, as well. Nothing to be done about the weather, of course, and they had several varieties of Paulaner beers on tap, so it wasn't a complete waste. There were tons of people, though. Lots and lots of people. And we all know how much the Smart Man and I just LOVE PEOPLE. Not. The Innkeeper told us Sunday morning that Saturday is always super busy at the 'fest, and that planning on a Sunday visit is usually better (provided you don't have to leave until Monday). So now we know - if we go back next year, we'll take a Monday vacation day, come up on Saturday, and enjoy the 'fest on Sunday, when there're FEWER PEOPLE. 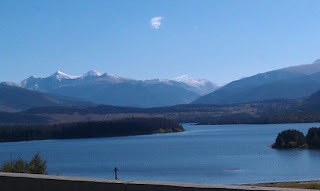 We came home on Sunday, and admired Lake Dillon on our way out. We may end up putting Frisco, the town next to the Lake, on our list for next year, provided there are sufficient activities to make us happy. While the Smart Man was a bit disappointed that the Oktoberfest was not more similar to the ones he attended as a young soldier in Germany, we still enjoyed our first Adventure - we love Breckenridge, and we'll probably go back at some point. Next month: The historic Stanley Hotel in Estes Park, Colorado! Agree the purple would not be my first choice. Well, since beer fests and blues seem to be enjoyable things for you and the Smart Man, next year you should try out Mammoth Lakes CA Beer and Bluesfest. The website still has the 2011 info though. Mammoth Lakes is a bit further than Breckenridge; on the other hand, it is remarkably beautiful with lots of outdoors and shopping stuff to do.